I am fascinated by the interplay between words and images, particularly in the creative process that occurs when a picture triggers a story. My story “To Dante,” published in Room Magazine (vol.31.1 2008), was inspired by Dante and Beatrice, painted by Henry Holiday in 1883. 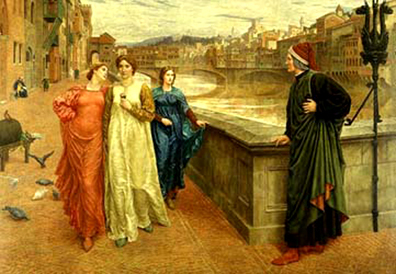 We see Beatrice in the painting, walking next to her friend Giovanna in Florence as Dante awaits their approach. My narrative, a blend of historical fact and fiction, is told from the point of view of Beatrice. The proximity of the two women in the painting inspired me to invent a relationship between them. When I was a virgin page my name was Bice de Folco Portinari. Now you scrawl all over me with perfect verses and call me Beatrice. I am everywhere–in your goblet of wine; in the flicker of the candle on your desk; in your reflection when you stare out the window after midnight. I resemble you so much–my name is Love. I walk down the Lungarno with Giovanna. You stand at the Ponte Santa Trinita, watching us. I clutch my rose; push my thumb into a thorn until it bleeds. I want to throw my hand into the Arno, let it drift under the Ponte Vecchio, watch a trinket merchant retrieve it from the cold water and wait for your next poem. Dante, stain me with black ink. Drown me in your inkwell. Stab me with your golden nib. Engrave me into rock and throw it into Vesuvius. Make me erupt into a molten sheet of syllables. Beatrice is so beautiful to read. I remember the first time we met, in my father’s garden, when you were nine and I was eight and the yellow butterfly landed on my cheek. How delicately you plucked it and pressed it between your palms. You kissed its lifeless wing and said you would keep it forever. Enigmatic are the hearts of boys who have lost their mother at seven years old. Durante Degli Alighieri, did you ever stop to think that your quill leaves scars? That this courtly passion of yours produces more than literary masterpieces? Townsfolk are gossiping. Simone wants to break our engagement. As we walk past you I avoid your gaze and concentrate on the scent of my flower. We go to Giovanna’s house. No one is there, not even the servant. From the sitting room window, I look at the hills basking under the languid Florentine sun. At the graveyard this morning, Giovanna gave me the rose. Giovanna takes me to her bedchamber. She shows me the purple silk she bought at the fair. She wants to sew me a dress. She drapes the sumptuous fabric on my body, pinning it into place here and there, paying particular attention to where it gathers under my breasts. Giovanna unties my hair, lets it flow down the way it does on brides, combs it gently between her fingers. My heart flutters like a butterfly, looks for a place to land–somewhere between the covers of an unwritten book. *Dante Alighieri, The New Life, (circa 1293), Chapter XXIV. In that hole of a room I was able to put myself into the skin of a young drug addict. I doubt I would have come up with the same material had I been staying at a Best Western for example. What happens to me in that type of hotel room is that I end up transfixed to the television, making up for the fact that I never, and I mean never, watch it at home. A few years ago, in a state of fury, I transformed our guestroom into my art slash writing space. It was right after a trip to Mexico. My head was dancing with images of Mayan ruins and I wanted to create! I emptied the room, painted it white, bought a gigantic piece of compressed wood with melamine finish, mounted it onto folding metal legs, and pushed it against the wall. This is where I make art. I write on a small pine table, perpetually covered with a Provençale tablecloth. When my father first saw it he asked, “What do you do here, serve meals?” That hasn’t happened yet but the olive pattern is food for thought and I like the warmth of the cotton beneath my forearms as I type. The walls are covered with a series of collages from my last solo show. I also have a corner with mementoes from the trip to Mexico, perhaps in homage to the energy that pushed me into creating a room of my own. There is a wonderful web article in the Guardian’s book section, entitled “Writers’ Rooms.” Adam Philips says, “The room is the view.” My window overlooks the two spruce trees I planted when my husband and I moved into our home thirteen years ago. Now these trees loom over the house and are a constant testament to the passing of time. Perhaps these conifers prod me on, reminding me not to waste precious seconds, as they grow yet another inch before my procrastinating eyes. I had fun looking at the writers’ rooms, 67 in all, and choosing the ones I would most want to work in. The locomotive shape of Margaret Forster’s room embodies that quasi-claustrophobic feeling that suits me so well. I can’t imagine writing on Michael Rosen’s desk. It overlooks the emptiness of the stairwell. I do like what he wrote about the too-small shoes, however, at the end of his room description. Judith Kerr’s room would be good for me; there are even drawers where I could store my artwork. My favorite room though belongs to Seamus Heany, an attic with a low skylight from which he watches the shipping action in the Dublin port. Barbara Trapido’s room includes a bed, where she can “bed down” two nights a week, and rise at 3 or 4 am, a concept that doesn’t particularly appeal to me. I did a stint of waking up at 5:00 every morning. My body floated out of bed, but my head stayed on the pillow, which was fine for writing my “morning pages” but nothing beyond that. Siri Hustvedt says, “A room to write isn’t like any other room because most of the time the person in it doesn’t see it.” Perhaps there is something lacking in my writing technique because I can see my room very well, thank you. 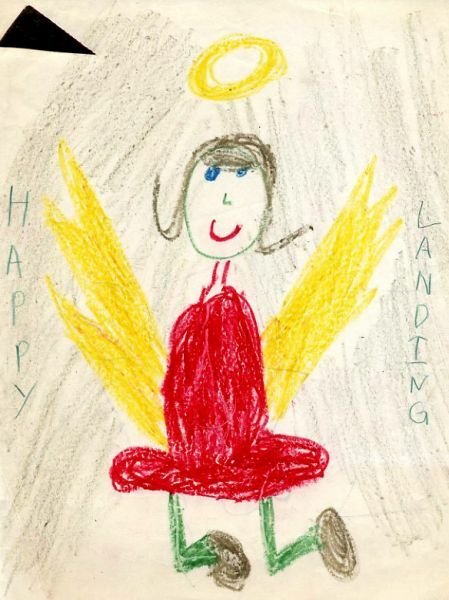 I not only wrote the final draft of my first blog entry, “Etch A Sketch of Childhood,” at the Magog Municipal Library, I figured out how to put it online. When I clicked the “Publish” button and saw my illustrated article on the web I was ecstatic, felt like jumping, screaming, giving the librarian a high-five, but I couldn’t, after all I was in Magog, not Brooklyn. So, with a lilt in my stride, I walked to my itty-bitty B & B room, squeezed in between the bed and dresser, sat at the miniscule table tucked under the sloping ceiling, and went to my favorite spot in the room, onto the page. 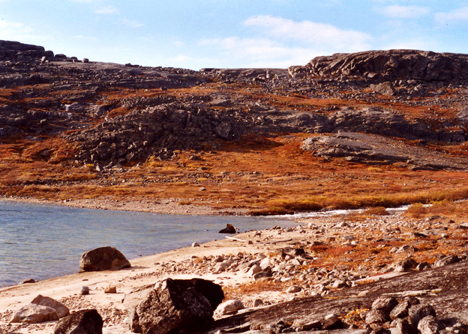 On September 23, 2003, I boarded an Air Inuit Dash-8 commuter Turboprop, headed for Inukjuak , Nunavik . This twin-engine plane, with a capacity for 37 passengers, or 29 or 21 when adapted for cargo, took me through turbulent skies to an unforgettable 17-day teaching adventure. 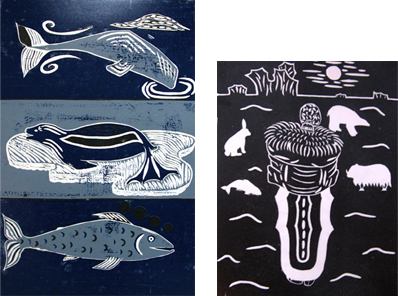 I was hired by the Makavik Corporation to give a woodcut printing class at the Annual Nunavik Artistic Workshops. 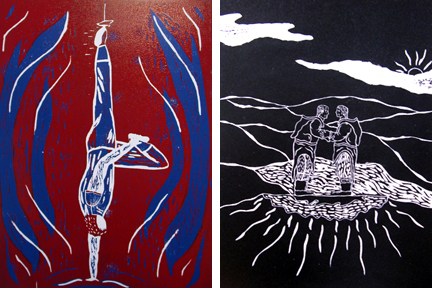 My first challenge was to set up a printmaking studio in a small, multi-purpose building that had last been used for a rummage sale. I taught eight students, ranging in age from 16 to 65. 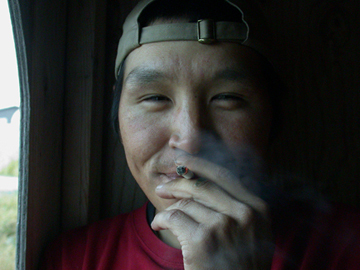 They flew in from Salluit, Quaqtaq, Kangirsuk, and Kangiqsualujjuak. Two of them lived in Inukjuak. 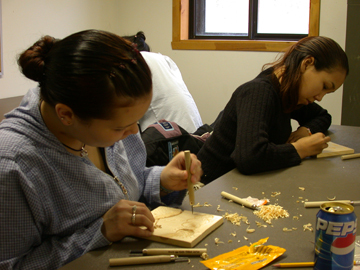 One student was a professional carver, and the others had little artistic experience. Although the students did not know each other, there was a natural camaraderie between them. The Inuit community in the Canadian Arctic feels like an extended family. I was comfortable with the group, basking in their chatter– a pleasant blend of Inuktitut and English. I got used to the rhythm of their frequent cigarette breaks, their easy laughter, and their ups and downs. Tragic stories are never far away up north. Two of my students had to deal with news of a suicide back home, committed by a teenager. Students comforted each other. A couple of the older women were particularly strong and supportive. I stuck to the task at hand. Art was not an immediate cure; it worked more like a natural remedy, taking its own sweet time to heal the soul. From my room at the Inukjuak Coop hotel, I could see a piece of Hudson’s Bay, rocky tundra and a tapestry of coral-colored lichen. I had an Igloo SpaceMate mini fridge and a drawer full of dry food that I brought up from Montreal, including dehydrated soy that found its way into numerous dishes that I cooked in the community kitchen. There were other transient guests such as construction supervisors and a marine biologist who went on walrus hunting expeditions with the Inuit and came back with anecdotes such as the one about how some Inuit youth repaired a VCR by defrosting it over a Coleman stove. When I wasn’t teaching I spent time either walking or driving around in a pick-up. I often strolled on the beech, a stretch of sand crisscrossed with 4-wheeler tracks. One Sunday, the community of Inukjuak offered the teachers an excursion. We navigated in two motorized canoes down the Innuksuak River to an enchanting bay. The open space of the rolling tundra took my breath away. So did the wind that bit through my Nepalese hat. Abraham, an elder, along with Johnny and his little brother, Andrew, pitched a big, white tent while the rest of us explored. Barthana, the carving teacher from Igloolik, spotted a caribou carcass. He determined that it had been killed the previous day and that we could eat it. When we sat in the tent, sipping tea and eating pieces of the boiled meat that we dipped into salt that had been poured onto a plastic bag I said to Abraham, “mamuktu,” delicious. One of the highlights of the workshops was the student show, held in the gym of the community centre. I was impressed with the prints. What gave me even greater pleasure was to see the joy beaming from my students. The whole community came to this exhibition, newborns to elders. 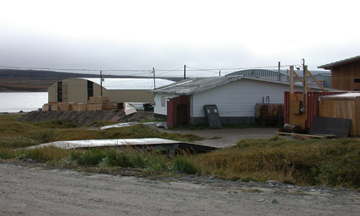 Finally I could see the faces of Inukjuak, which often resembled a ghost town during my walks. My students greeted the public like seasoned artists, shaking hands and explaining techniques. I had done my job. Much artwork sold that night, to locals and to white folk. After I returned home I corresponded with several students. I even met three of them in Montreal at various times. After I left, Siasi sold so many prints that she was able to buy a new fridge and stove! 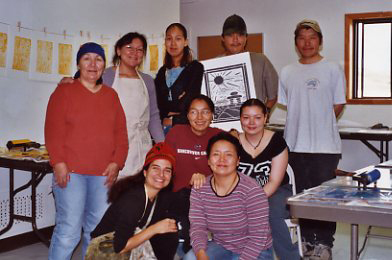 Her next project was to set up a printmaking studio in Inukjuak. Today I brought home Mother Zeppelin, my print that was selected for the Voir Grand Biennial, a national large format print contest, organized by Atelier Circulaire. The exhibition was held at the Maison de la culture Villeray–Saint-Michel–Parc-Extention, in Montreal, from May 8 to June 8, 2008. Sixteen finalists, hailing from Vancouver to Halifax, were selected. The jury consisted of Mathieu Beauséjour (artist and coordinator of Clark), Geneviève Goyer-Ouimette (responsible for the Collection de prêt d’oeuvres d’art, Musée national de beaux-arts du Québec), and Irene Whittome (artist). Mother Zeppelin is a reflection on human identity in relation to the experience of home. It is a visual play of words where color, texture, composition and figurative imagery interact with writing. In a house, words are arranged alphabetically from top to bottom, in two vertical columns. Read in this order they become an inventory of the house. 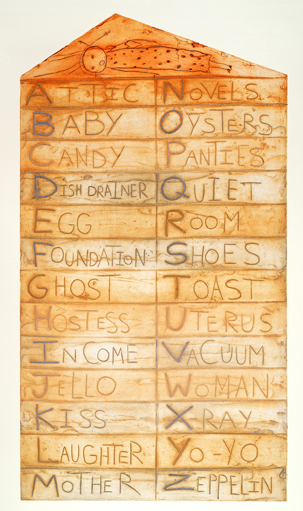 The words may also be read across, two at a time along horizontal lines, creating whimsical combinations that suggest images and emotions connected to the theme of home. Interpretation is of coarse subjective and may suggest more than one meaning. For example, GHOST TOAST might make one think of a piece of toast that has been left at the kitchen table long after family members have headed off to their day’s activities. It may also conjure the image of food that has been set at the place of a deceased loved one. LAUGHTER YO-YO suggests the pleasure of play. 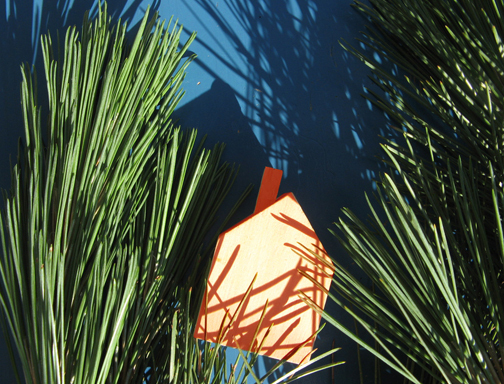 It also alludes to the variable emotional climate of a home. The words, regardless of how they are read and interpreted, create mental images and sensations that influence the way we understand this print. Every year, from January through June, I give art workshops in schools across Quebec. I feel like a missionary, traveling from village to village, spreading the good word about printmaking. From Thedford Mines to Asbestos to Lac-Megantic, I’ve been there. Sometimes I want to plaster a Quebec map with red dots, representing all the towns where I’ve taught. It would have to be a big map and it would end up looking tacky but it would be something interesting to do on a rainy day. Today and tomorrow I’m teaching at École Dominque-Savio, in Saint-Catherine-de-Hatley, eight kilometers east of Magog, in the Eastern Townships. This is the third school I’m visiting in the area since April. I always stay at La Maison Verte, in Magog, on Merry Street, across from the church and a hop away from rue Principale. This charming house, originally owned by a doctor, belongs to Monsieur and Madame Tremblay. Their bed and breakfast should really be called a breakfast and bed, because the petit déjeuner here is a serious three-course affair and if truth be told, it’s what keeps me coming back. The crêpes are delectable, as much for the eye as for the palette. Madame T sprinkles powdered sugar on the rim of the plate and presses a butterfly mold into it. The printmaker in me can’t help but being impressed by this detail. This morning, after savoring my crêpes, I drive through the rolling hills, along the 108, to Saint-Catherine. The school is located across a barn and overlooks the valley. I teach three classes today. 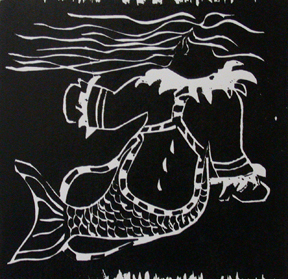 After I demonstrate how to print a linocut with a spoon, the students are eager to engrave into their Styrofoam plates and print them onto paper. 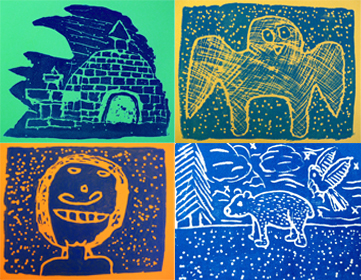 Grades five and six work on the theme of Inuit art. 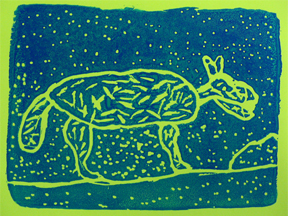 Grade three makes prints of animals. Whenever I present the animal theme I ask the students if anyone has a pet. Since my family doesn’t even own a goldfish, I’m always surprised to see ninety percent of the children raise their hands. I ask them what animal they own. In Montreal this query elicits the usual cat-dog-hamster-guinea-pig answer. 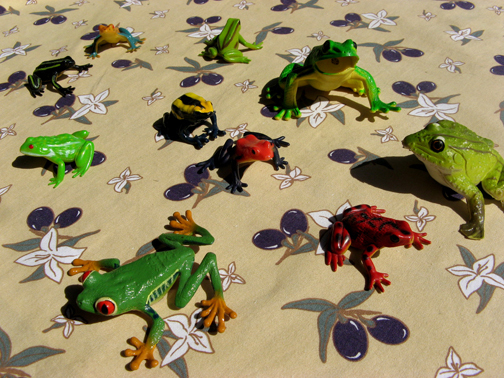 It’s a whole other ball game here with answers ranging from frogs to horses. One girl proudly announced that she has two roosters, five laying hens, and twenty-two chicks. A boy says he wants to draw a wolf but doesn’t know how. I tell him to take it step by step and to start with the body. On his desk I trace the oblong shape of a wolf’s body with my finger. The boy gets to work. He periodically states that he cannot draw the other parts of the animal’s body– the legs, the tail, the head… Each time I inject a dose of confidence with a few choice words or with my finger-tracing method. When he announces, “I messed up the head,” I suggest that he add another line to enlarge the profile. It is only when he sees his printed image that he admits, with a beaming smile, that his work is good. “My teacher Guylaine is good, isn’t she?” I agree that he has a very good teacher and suggest that he tell her that. I like to think that his positive experience with his wolf print made him connect to that good thought. Undoubtedly she too has been encouraging him throughout the year. Teaching is such a human enterprise. It’s not just the transmission of knowledge. Ultimately, and at its best, it is helping people discover themselves. Teaching is a wonderful way to connect to people, whether the students are children or adults. When I teach on the road it also gives me the opportunity to discover new places. After my day at Dominique-Savio, I return to Magog and roam in the village. 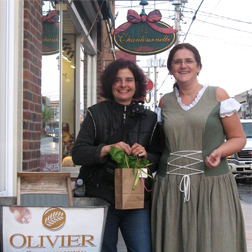 I discover the Olivier soapery, an ecomuseum, on rue Principale. Guylaine (seems to be a popular name here) gives me a tour. The soaps’ main ingredients are olive oil, bee’s wax, and coconut butter. I buy honey soap, shaped like a honeycomb with a bee on it. According to the label it is a “soul soothing sweet tension reliever,” just what I need after a day of teaching. Guylaine is happy to pose for this photo, especially when I ask her I if I can post it on my blog. She wants you to know that she’s much younger than she looks in the photo! 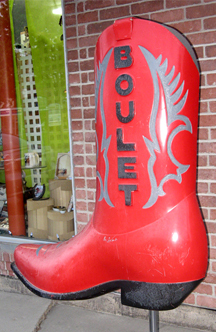 I go to Boutique Eq’Estrie, my favorite store in Magog, not that I’ve been in any of the others apart from Rossy, where I like to go because it reminds me of loitering in Woolworths when I was a tween, back when the word tween did not exist. At Eq’Estrie you can buy everything you need for your horse. My students probably shop here for pet supplies. They have a wall full of halters, displayed according to horse size, weanling to draft. A fluorescent- rainbow halter catches my eye but I think I have to buy the horse first, you know, so that I can purchase the correct sized halter. On a bulletin board I look at ads for horses for sale. Prices started at 600$ for a twenty-month-old pony, which is a lot cheaper than the 3000$ used saddle that’s advertised. But I think I’m too big to ride a pony. There’s a five-year-old gelding available for 2700$ but I think I need to buy the farm first. For the moment a farm is out of my price range so I settle for a pair of ultra funky cowgirl shoes. They look like something Jane Birkin would wear. I browse through the horse beauty products. I discover Mane ‘n Tail detangler , Cowboy Magic Super Bodyshine, and Rio Vista Color Enhancing Shampoo with chestnut extract. I’m tempted to buy a sponge attached to a purple plastic handle — “Wash, groom and massage in one easy step.” Who needs a horse? I can use this on my own body, with my soul soothing honey soap from Olivier. Instead I buy a round paintbrush used to apply oil on hooves. Should be fun to use for art projects. On my way out I spot crocheted ear protectors, with gold trim! I feel like a woman who gawks at knitted baby booties and yearns for a baby. Sometimes I get this vision of living on a farm, painting in my studio in the woods, writing in the attic of a quaint farmhouse, and riding my horse over the open glades between chapters in progress. For now the western shoes will have to do. Now all I need are the Jane Birkin legs. I walk with my own legs through the night to La Maison Verte. 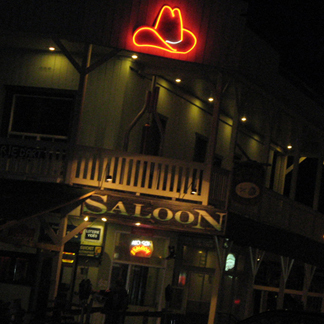 On the way I spot the Saloon, down on Bullard Street. Looks like a Lucky Luke hangout. Would be an appropriate place to try out my new shoes. I can practically hear Shanaya Twain calling me. But this woman needs to get back to the green house on Merry Street to get a good night’s sleep. Tomorrow I have a hundred more students to convert. Ever since I can remember my mother has been making things. When we lived in Saint-Jean, Quebec, she painted my canopy bed and tallboy with Pennsylvania Dutch motifs. Perhaps sleeping under a canopy of red and turquoise hand-painted flowers had something to do with my becoming an artist. In the basement she painted a paneled pine door that led to a rarely used guest room. The door was green with big red hearts, painted with glossy enamel paint. Inside were two twin beds, a small table in-between, and a linoleum floor with an engraved bubble motif that looked a lot like a print I made in art class several years later. That little table was where my mother piled her finished wall hangings. 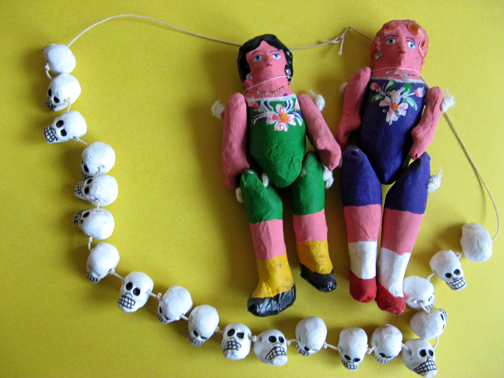 She made these decorative pieces by gluing felt animals onto burlap backgrounds with LePage’s white glue. I liked spreading a thin layer of glue on my palm and peeling it off when it dried, all my lifelines clearly imprinted on the film. I was also intrigued by the glass evil eye beads that my mother used for the animals’ eyes. Eventually Mom would haul the wall hangings to the big city, Montreal, to leave them on consignment in stores. I always looked forward to her next batch so that I could escape to that hushed chamber behind the door of hearts, to inspect her handicrafts that still smelled of LePage’s glue. In the unfinished section in our basement, lay an ominous rust colored oil tank that gave me the creeps. The other end featured a ceiling-high mountain of household clutter that included an electric floor polisher that I never saw put to use. It was a beige and olive contraption that had a detailed drawing of a Viking ship on it. My neighbor Lori-Ann’s mother put her polisher to work daily. Their kitchen floor looked like a freshly Zambonied skating rink. Whenever Lori-Ann and I pranced across it on the way to the playroom, usually toting Barbie and mini suitcases full of her clothes (items which my parents refused to buy for me) her mother, in her perpetual beehive hairdo, would warn us girls not to slip and fall. My favorite item in our heap of stuff was a leather suitcase, plastered with stickers from Niagara Falls, Lake George, and Coney Island. Next to the mound of domesticity, my mother had a table where she painted wooden decoy ducks. I liked looking at her paint cans and brushes and the haphazard formation of unpainted ducks on the cement floor, waiting for their beautifying ritual. Mom would scavenge antique stores that dotted the country roads of the Richelieu valley and buy ducks, flocks of them. Today my bedroom door is held open by one of her ducks. Under it’s tail it is written MIMI. Mimi’s creative energy motivated me to embark on similar creative enterprises. When I was attending CEGEP, I borrowed my stepmother, Brigitte’s lime-green Renault 5 and hit the dairy zone of Saint-Hyacyinthe, Quebec. I’d spot farmhouses, scan for ferocious unleashed dogs, and if the coast was clear, knock on screen doors, asking people if they could sell me metal milk cans. 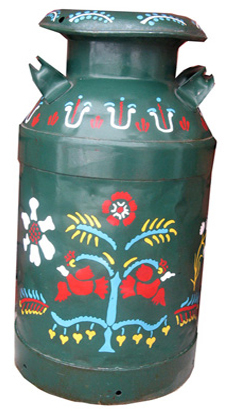 When I explained that I painted the cans with decorative designs, these folk were sympathetic to my cause and often sold me a can or two for anywhere from five to eight dollars a piece. 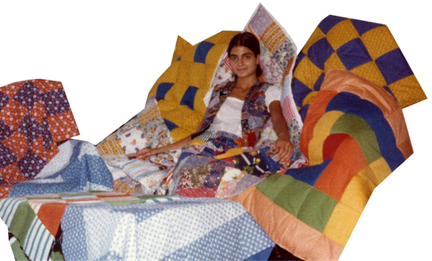 The following year I made a series of crib patchwork quilts with my mother’s Singer sewing machine that whined whenever the thread got tangled. I used scraps from Mom’s sewing projects. I’d leave the quilts on consignment at the Canadian Guild of Handicrafts on Peel Street, my mother showing me the ropes, and threads, every step of the way. When my son was born twenty years later he slept in one of these quilts. Now he’s almost as tall as I am but he still uses his yellow and orange quilt, not to sleep in, but to line a basket in the living room for Shira, the neighbor’s cat that visits us daily. When I was in high school my mother organized a craft show at Victoria Hall in Westmount, Montreal. At the time I was making candles and figurines out of salt dough. My mother offered me a table at the show. Next to her elaborate display of hand-sewn belts and purses I sold my little candles and little people on a big table that made me feel very artsy. There I was with jewelers, ceramists, hat-makers, wood-carvers, weavers… They had long hair, wore funky clothes and easy smiles. I felt connected with this crowd and their creative energy. I remember what my mother said to me after the show was over, “Now I know what you like, you like people.” Not just people, Mom, artists. Not that artists aren’t people but they are, as I discovered years later when I joined a community printmaking studio, a breed apart, a band where I belonged. Today, after a successful career as a fashion designer, my mother makes one-of-a-kind beaded jewelry and sells her work at craft shows around Montreal. I recently took her jewelry for a jury selection for one of these shows. A jeweler complimented me lavishly on the unique quality of the necklaces and bracelets that I had carefully set up for the jury to inspect the following day. I was proud to admit that I was not the artisan and to give full credit where it was due, to my mother. Sherbrooke, Quebec, 1963. I’m four-years old. My father and I are coloring a little girl playing hopscotch in my coloring book. Bedtime is creeping up but the clock stands still when you’re breaking in new crayons — a box of 48 Crayola wax crayons with a built-in sharpener that makes curly shavings. Crayola has not yet invented crayons that glow in the dark, sparkle with glitter, change colors, smell like watermelon, or wash off walls, windows, and bathtubs. But I’m thrilled with my gold, silver and copper crayons. My father colors the sole of the girl’s shoe gold to make it look dirty. Since he doesn’t press hard there is no iridescent effect. It doesn’t look as if this happy-go-lucky girl has 24-karat gold leaf underneath her Mary Janes. The sole of her uplifted shoe simply looks a tad worn, a testament to her playful endeavors. I’m impressed. Now I try out as many colors as I can, including Peach and Midnight Blue. Had I been coloring before 1958 I would be have been using Prussian Blue instead of Midnight Blue, which in fact is the same color with a different name. 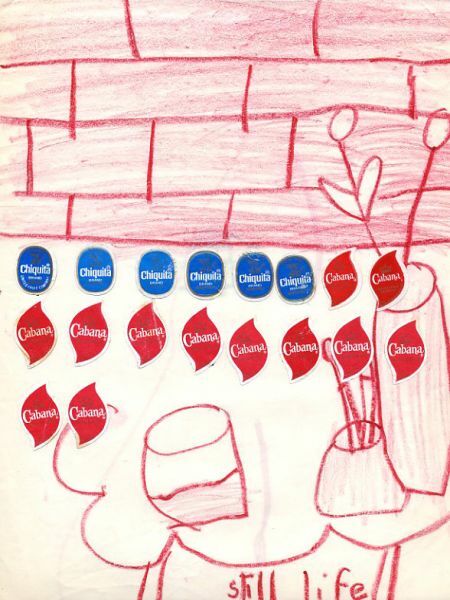 Crayola changed the name because teachers felt that children were not familiar enough with Prussian history to recognize that this crayon color referred to the deep-blue uniforms of Prussian soldiers. When I used my Peach crayon I was oblivious to the fact that a year earlier this color used to be called Flesh. In 1962, partly in response to the civil rights movement, the Flesh color was renamed Peach, in recognition of the fact that skin comes in various shades. I never colored faces, preferring the natural tint of newsprint to any of the politically correct shades available in my box of crayons. That coloring book episode is my earliest memory of making art. 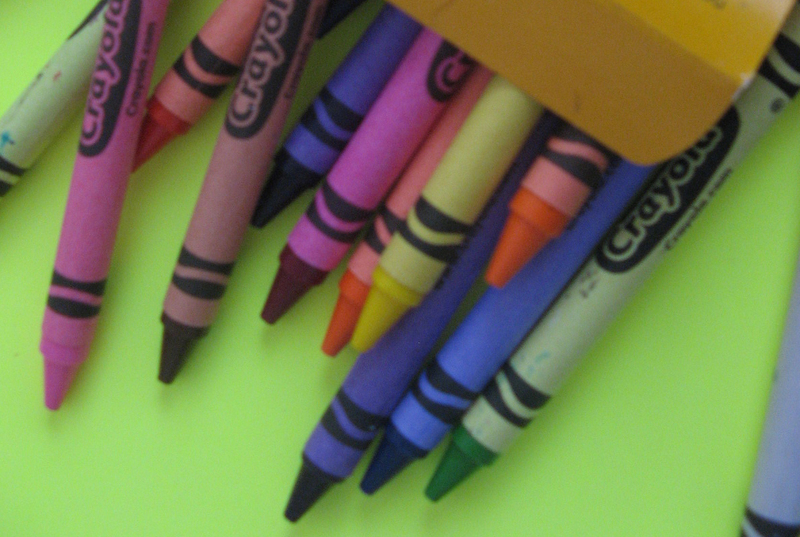 Coloring books have gotten their share of slack for inhibiting children’s creativity. I grew up with them and became a professional artist. I know what you’re thinking: She sounds like the ninety-year old pack-a-day smoker who boasts of excellent health. Let’s consider the merits of a coloring book from a child’s point of view. There’s the obvious virtue of making you look like a master artist just because you’ve carefully colored within the boundaries of the lines. When it comes to choosing what to color the decision-making process simply involves flipping through pages, almost as easy as clicking on a mouse. And the coloring book is easy to tote along when you go to visit boring relatives. For some reason I don’t have memories of coloring freehand. There must be something comforting about the pre-drawn designs in coloring books that imprinted in my mind: The Mickey Mouses, the Santa Clauses, the Tweedy Birds, the baskets of Easter eggs, the farm animals, the jungle animals… Luckily my father kept some of my freehand drawings from when I was a child, all carefully tucked away in a filing cabinet. 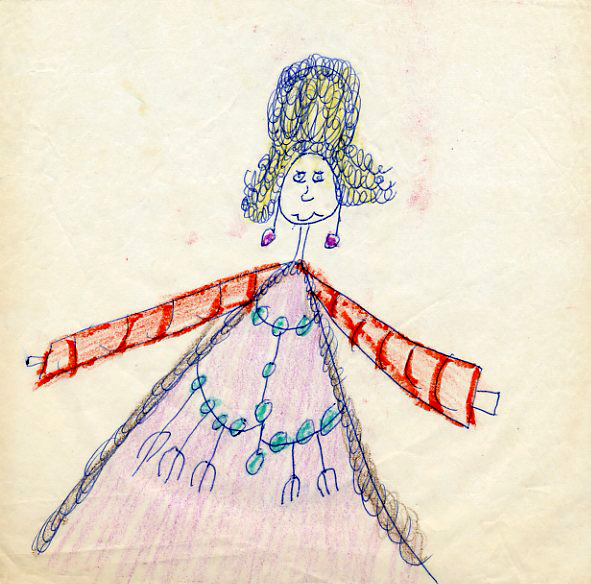 A note to parents: save your kids’ artwork, and date it. 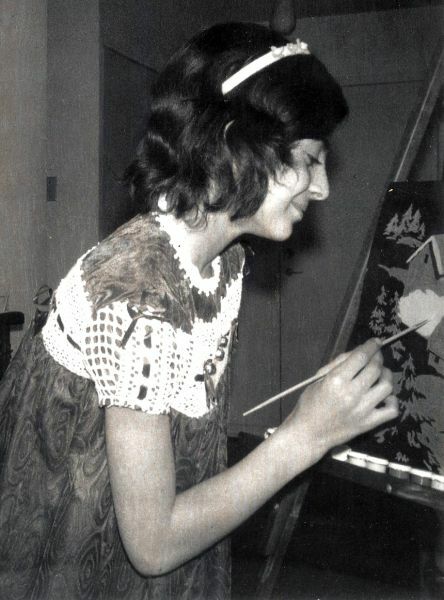 Thanks to my Dad’s judicious filing techniques (he even kept a copy the “Feeding Schedule” from when I was one month old, before the days of feeding-on-demand) you can view three works of Talleen Hacikyan, exhibited here for the first time, all made somewhere between 1964 and 1969. 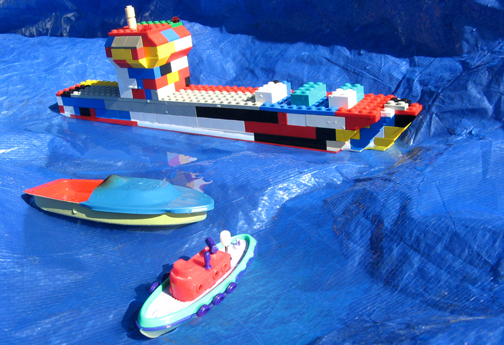 When I think of making art as a child I remember certain toys. Spirograph was one of my all time favorite toys. 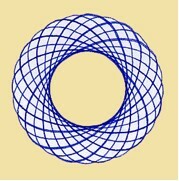 I must have made hundreds of circular designs with it. It works by rolling a plastic gear inside or outside of a plastic ring. 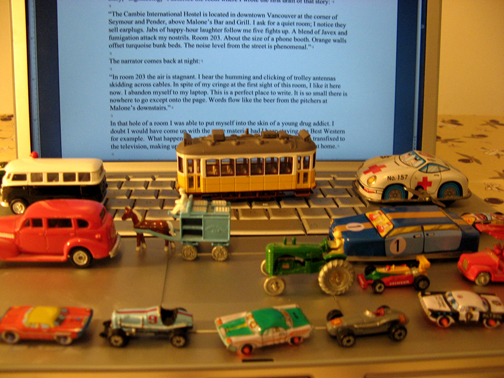 A few years ago I bought a cheap imitation from a street vendor in Istanbul for my son. The plastic is too thin and slips constantly. I was more disappointed than he was with this impulsive purchase. One small consolation is that I discovered that the web is full of sites that sell items with Spirograph patterns on them, everything from desk mugs to diaper bags. For my birthday I want a set of Spirograph sheets. If I can’t make Spirograph designs let me sleep in them. One Christmas I unwrapped a huge box –Rings ‘n Things, the first item on my wish list that I had personally mailed to the North Pole. The kit came with “gobbledy goop” that I poured into metal molds to make rings and pendants of butterflies and flowers. I remember lots of pink and the thrill of observing imprinted details when I pulled out the hardened goop from the mold. The following Christmas a family friend got me a pyrography kit, which I had never asked for because I did not know what pyrography is. I discovered that it is the art of burning designs into wood. The kit came with thin wood plates, printed with designs of horses, chipmunks, roosters, etc. With an electrically heated needle that had adaptable tips I would burn the patterns. I loved the smell of the burning wood and the way I could modulate the intensity of browns according to how long I let the wood burn. the easel but there is no trace of my velvety chef d’oeuvre. Making art makes me feel good. Not all the time, but when I’m totally immersed in what I am creating, when my piece dictates how to continue working and when this silent dialogue between myself and my art becomes so engaging that the outside world evaporates, I feel good. When I create a collagraph plate designed for printing onto paper, I work (and play) on cardboard. As I make textures with plaster and glue bits of eggshells, coffee ground, leaves, and sand, I connect to the little girl who colored a monkey eating a banana, who made pink plastic rings, and who etched a marvelous childhood, if only to have it shaken by the passing of time until it vanished into the realm of memory.